Article for The National Psychologist: Master Therapists. This appears in the current Jan/Feb 2013 edition of the National Psychologist: Vol 22, No. 1. Dr Debbie Joffe Ellis talks about her late husband and his work: Dr Albert Ellis, Master Therapist. 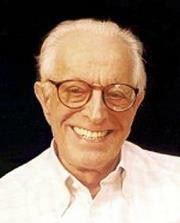 Albert Ellis, legendary pioneer in the field of cognitive psychology, was a genius. He created his approach of Rational Emotive Behavior Therapy (REBT), describing its methods and techniques in clear style - through his writings, presentations, trainings and therapy sessions. REBT was understood and embraced by people within the world of psychology and those from every walk of life. His whole-hearted and earnest goal was to help as many people as possible to suffer less emotional misery and to experience more happiness in their lives. His tireless work over more than six decades helped millions of people change their lives for the better. Yes, Albert Ellis was a genius. He was my mentor, my model. He also happened to be my husband. When I studied the various psychological approaches during my university days, it was his approach toward which I felt magnetized. I loved its clarity, its efficiency, and its holistic embrace: recognizing the interrelationship of thinking, behavior, and emotions. I loved its humanistic and philosophical emphases, and after first meeting the man (years before we began our relationship) – I loved him. I loved his vigor, his definite and unforgettable style of communicating, his humor, his honesty, and above all his authentic care and compassion for those who were in emotional distress. From the moment our relationship started we were practically inseparable, and l worked with him in each aspect of his work – including writing, presenting, giving workshops and co-leading groups. I witnessed his approach with students, clients and members of the public in our work settings, and in every other scenario of our lives. I could write a large volume detailing the many outstanding qualities he exhibited as a master therapist, but for the purpose of this short article I have selected just a few of them to share with you. Authenticity, straightforwardness and practicing what he preached. He reminded us that all humans are fallible, prone to acting both for and against our healthy goals, but that we have the power to control our emotional destinies, and that by choosing to think in healthy ways we can create appropriate and healthy emotions. With urgency he would often remind us of the swift passing of time – encouraging us to use it well, and not waste it by creating unnecessary misery. And he did not waste a minute of his time. He would usually work 16 hour days. On planes, in doctors’ waiting rooms and elsewhere – he would never sit idly. Instead he would engage in writing, reading or composing songs and poems. With straightforward language he would teach the REBT tools which help change and prevent emotional suffering, and often share his own experiences of using them on himself in dealing with his unhelpful tendencies. He never presented himself as someone occupying any altar of “holier that thou” perfection. He spoke of his successful efforts as a young man in overcoming painful and debilitating shyness. He spoke often of the on-going effort he continued to make to prevent, for example, his largely inherited tendency of impatience and low frustration tolerance. He reminded us that, for each one of us, ongoing work and practice are required for the maintenance of healthy change, sharing his example of doing so with successful results. Hence many people felt at ease in his company, did not feel judged or damned for any flaws – they witnessed his unconditional acceptance of himself and heard of his ongoing efforts. They felt his unconditional acceptance of them. Al was an authentic model of what he was recommending, in addition to being teacher and therapist. As a consequence of this, many were less defensive and more receptive to hearing and acting upon recommendations for changing. Al did not pander to any justifications that some people presented for continuing to think and behave in their self-defeating ways. He would dispute such ideas and did not go along passively with clients or students who were hurting themselves. His no-nonsense definite manner added to the motivating energy he provided. And underneath all of that, most people felt his genuine care and concern for their well being. Journalists and others have written about Al’s experiences during his final years of life: being ousted off the board of his institute and then being re-instated by a Supreme Court judge (even though it was too late to have any impact); of his being stopped by directors from presenting programs in his institute (we rented a room in the building next door to continue giving workshops); and of his sadness in discovering that the original mission statement for his institute had been changed without his knowledge or approval. He felt deeply saddened by these and other related events – and yet continued to practice what he preached. He did not damn or hate the people involved – he was very clear about that. He hated their actions – but did not hate them. Hence he did not experience rage, or depression, just a deep sadness which was wholly appropriate in those circumstances. He also felt genuine compassion for those people. One afternoon as my tears fell following an incident I considered very harsh and unjust – he gently reminded me “Accept, Debbie, accept. Since they think in the way they think, then they have to act the way they act. We don’t like it. But we had better accept it.” He taught me, and showed me, that unconditional acceptance of others is something we can choose to experience, when we are willing to put in the effort. It may not arise automatically when people act against our goals – hence effort is required. As a result of doing so I felt steadied, less devastated, less hopeless and felt appropriate concern and sadness. Consequently when I work with clients who would benefit from working to choose to accept what they cannot change, I do so with comfort and conviction. I know that I am not just spouting a familiar line or presenting a Pollyanna-ish ideal. I know from my experience that the attainment of unconditional acceptance, though often difficult to do in dire circumstances, is nonetheless achievable when one makes the choice and puts in the effort. And well worth it. The final 14 months of Al’s life were marred by brutal ill health, yet he continued to practice what he preached. In addition to making effort to change undesirable circumstances with whatever strength he had, he accepted the likelihood that he might not succeed. Though we felt deep sadness, we also practiced another important REBT principle – accepting our sadness whilst also focusing on what was good and positive. Each and every day we relished being together, grateful for our love and remarkable closeness. Though so many things were not going well, we still had one another. And with gratitude we focused on that love, and cherished it. Humor and Keeping Things in Healthy Perspective. He said this warmly, with a smile on his face, and she roared with laughter, gaining new perspective on her unrealistic thoughts and self assessments, as he continued to use REBT with her. Over time she successfully worked with Al to stop putting herself down, and her depression and anxiety diminished remarkably. In our everyday life together Al used humor constantly – including during the tough times. In 2003 after some months of abdominal discomfort, Al suffered severe symptoms and we rushed to the hospital. His large intestine was severely infected and in danger of bursting at any moment. 2013 is the centennial anniversary year of Al’s birth. Born with great intelligence and capacity for innovation and creativity, his life and work and his immense dedication to helping people, contributed to their well being in profound ways. He was a deeply caring and truly golden-hearted man. His practice, modeling and teaching of the benefit of choosing to constantly work on gaining and experiencing compassion, kindness and unconditional acceptance of oneself, others and life itself during challenging times may have been one of his most important contributions. This attitude was healing for the recipient and elevating for the practitioner. His life and works will inspire many for years to come. Ellis, A. & Ellis, D.J. (2011) Rational Emotive Behavior Therapy. American Psychological Association: Washington DC. Ellis, A. (2010) All Out! An Autobiography. Prometheus Books: Amherst, N.Y.
Ellis, A. (2005) The Myth of Self Esteem. Prometheus Books: Amherst, N.Y.
2013 is the Centennial Anniversary of the birth of Dr Albert Ellis Ph.D. Below is a press release written by his wife Dr Debbie Joffe Ellis. Dr Albert Ellis ignited, and powerfully fuelled, the cognitive revolution in psychology, counseling and therapy, with his pioneering approach of Rational Emotive Behavior Therapy (REBT) in the 1950’s. In addition, he helped transform limiting and uncivil social mores and attitudes of the time, with his vigorous actions supporting equality for women, gay rights, inter-racial marriage, ending of censorship and many more. He has often been referred to as “The greatest humanitarian since Gandhi”. He wrote over 85 published books and over 800 published articles, presented tirelessly around the USA and across the globe, and helped millions of people through his REBT approach to suffer less emotional misery and to experience more happiness in their lives. 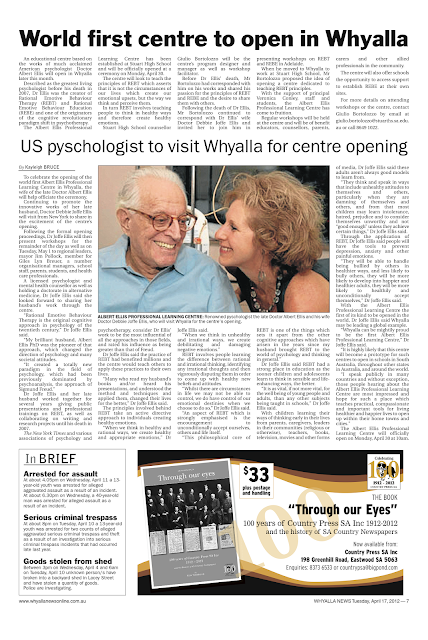 During his Centennial year 2013, his wife Dr Debbie Joffe Ellis is available to speak about Dr Albert Ellis and his legacy. Born September 27th, 1913, this year marks the centennial anniversary of his birth. At various major conferences throughout the year tribute will be given to this great man and his contributions. He will be honored posthumously on August 1st, 2013 in the opening ceremony of the annual American Psychological Association convention with the ‘APA Award for Outstanding Lifetime Contributions to Psychology’, which is one of APA’s highest honors. The first tribute of the year will be presented in a Symposium at the annual Eastern Psychological Association conference, held in New York City, in March 2013. It is hoped that many will attend the various tributes throughout the year, and be inspired by the remarkable works and character of Albert Ellis PhD. Some not only wish that life were as they would want it to be but insist it should be so. This fanciful way of thinking projects a world where everything is as it ‘oughta be.’ Do you ought should or must on yourself, others and the world? Must you always meet your own lofty expectations of yourself? Must others always treat you as you would like to be treated? Must life in general always deliver what you want? This form of oughtism manifests in all manner of ailments that get in the way of achieving our goals. For instance ‘should’ that driver have let you in back there and is he an idiot for not being as attentive as he could (should?) have been? Are you a hopeless case for getting a C minus in your assignment instead of the A you ‘should’ have got? Should life be easy for you and deliver to you all that you want to be happy? Isn’t it so unfair when things don’t go your way? These constructed oughtistic beliefs deny us the ability to deal with challenges appropriately. For instance if we think the driver above should have let you in and he is an idiot for not doing so we may feel angrier than we need be. We may also act aggressively and make poor behavioural choices. Is he making you mad or is your anger a result of your demand that he should have acted more courteously? Is it reasonable to think that as adults we are now able to assume responsibility of our own emotions and behaviour? Is it not better for our children to observe us dealing with situations in a constructive way so that they won’t develop these self (and other) destructive oughtistic tendencies? Train yourself to monitor how you react emotionally to a situation; identify how you feel and how strong that feeling is. Do you feel mad (say 7 or more out of 10)? Are you about to rant and throw stuff? Take some deep breaths and remove yourself from the situation. She will learn that sometimes things happen that we don’t like but we don’t turn minor problems into catastrophes i.e. We prefer people were more courteous on the road (sometimes they make mistakes). Oughtism: The oughtomatic tendency to think in oughts, shoulds and musts. 2. These beliefs can be largely helpful (rational) or unhelpful (irrational).